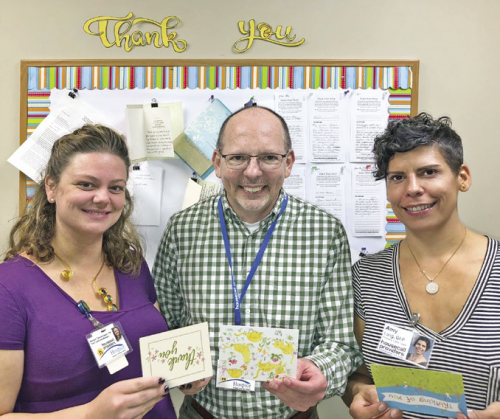 Hospice Nurse Lead Morgan Clemenhagen, Hospice Chaplain Scott Winters and Primary Care Provider Amy Long in front of the “Wall of Gratitude.” Staff enjoy reading how their care makes such an impact on the patients and families served. On behalf of the entire Housecall Providers team, we want to say THANK YOU for the tremendous outpouring of support we have received from patients, family members and caregivers since launching our Gifts of Gratitude program earlier this year. We are truly honored and affected by the many thoughtful notes and generous donations that continue to come in from the people who have experienced our care firsthand. Hearing about how home-based medicine has impacted the lives of our patients and their family members has energized our whole organization — especially our clinical team members, and reaffirmed our sense of purpose here in the metro area. Thank you to everyone who has shared their story with us or made a gift to help support our work. We are excited to hear even more stories about what our care means to those we serve. What have we heard so far? If one of our clinical teams or an individual made a difference for you or a family member, please consider sharing your story with us on our Gifts of Gratitude page.